Palm oil is not equal to palm oil: Since plantations differ massively in environmental and social criteria, a general ban of palm oil in biofuels, as recently discussed by the European Union, would punish the wrong producers while having little impact on reducing deforestation. Biofuels, including biodiesel, help to mitigate climate change by replacing fossil fuels. In the European Union (EU) the main raw material for biodiesel is rapeseed, followed by palm oil. Annually, the EU imports around seven million metric tonnes of palm oil from tropical countries, of which over 40% is used for biofuels. In April 2017, the European Parliament voted to ban the use of palm oil in biofuels by 2020, ostensibly to limit the deforestation which has been blamed on the expansion of oil palm plantations. Norway has followed suit, with even tighter targets that ban the use of palm oil biofuels by public bodies by the end of 2017. The French environment minister has also pledged to stop "imported deforestation". Many will welcome these policies, concerned as they are with the environmental damage attributed to palm oil production. 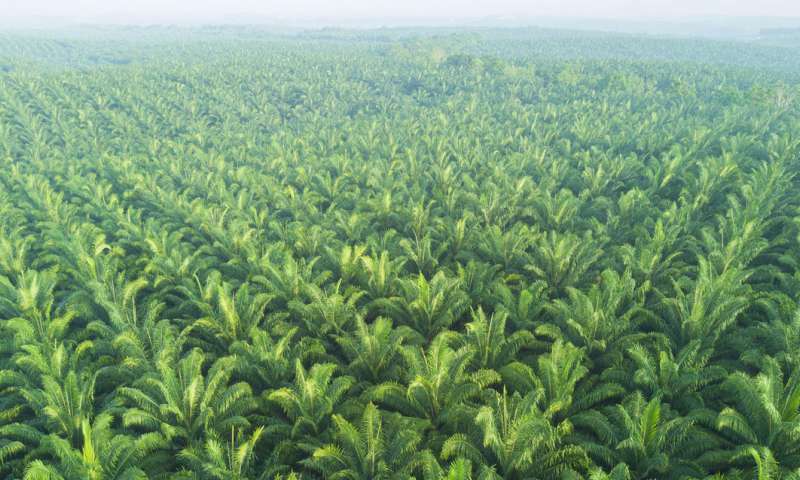 Yet a simple ban ignores the complexity of issues that swirl around the oil palm debate. While environmental organizations have highlighted illegal and environmentally damaging activities by the oil palm industry in Southeast Asia, other palm oil producers risk being unfairly tarred with the same brush. Colombia, although far behind the main producers Indonesia and Malaysia, is the fourth-largest palm oil producer, with close to half a million hectares planted. Oil palm plantations in Colombia, and indeed in Latin America as a whole, have mostly been planted on land formerly cleared for cattle ranching. Of 155,100 hectares of new oil palm plantations established from 2002 to 2008, 51% were developed on former pastures, 29% on former croplands, and only 16% carved out of forests, savannas, and regenerating forest lands. Moreover, replacing fossil fuels with Colombian biodiesel produced on former pastures allows immediate reductions in greenhouse gas emissions, while it takes 30 to 120 years for biodiesel produced on former rainforest to compensate for the emissions resulting from deforestation. While not perfect, nor completely deforestation-free, the environmental impact of oil palm produced in Colombia is relatively low. Colombia is, moreover, working with the palm oil sector on a Zero Deforestation policy to ensure that palm oil is produced without incurring any net forest loss. The Colombian oil palm industry is also in the process of adopting the standards of the Roundtable on Sustainable Palm Oil (RSPO), and working towards implementing International Sustainability and Carbon Certification (ISCC) standards, both recognized by the European Commission as guarantees of sound environmental and social practices. The growing European biodiesel market is central to Colombia's palm oil industry, and the drive to adopt ISCC standards was specifically to gain access to the European biodiesel market. Colombian palm oil risks being banned alongside palm oil produced in regions with larger ecological footprints. A blanket ban will reduce the EU's influence in encouraging high sustainability standards across the world, and could send a counterproductive message to producer countries striving to meet such expectations. Indeed, the Indonesian agriculture minister threatened to halt palm oil exports to the EU , the implication being that exports would instead be shifted to less discriminating regions. A more nuanced policy is required: one that rewards industries and countries that promote sustainable standards. The EU should therefore implement its ban selectively, discriminating among palm oil sources based on sustainability criteria. The EU's Renewable Energy Directive already provides a mechanism for such differentiation across all biofuel feedstocks. This mechanism needs improvement, as it does not yet take sufficient account of biodiversity and social issues, and instead focuses on greenhouse gas emissions. Greater investments in traceability from production through to consumption are also required. If a ban ignores differentiation and traceability, it risks undermining efforts to improve sustainability in producer countries, especially in regions that are making substantial efforts towards sustainability. A more selective ban based on effective traceability of sustainable palm oil will not only support good practices in Colombia, but will also encourage producers and agro-industries around the world to do likewise.